> SEO > International domain structures and SEO: what works best? Businesses with multiple websites across different countries have a number of decisions to make on how they structure their various sites. But what are the advantages and disadvantages of each? In this post we’ll look at the different approaches using selected major corporations to show what type of domain structure strategy they use across their family of international sites. Sub-domain structure (e.g. usa.tommy.com v uk.tommy.com). Separate language / location sub-directories (e.g. nike.com/gb-en etc). Separate TLDs (e.g. amazon.com v amazon.co.uk). Separate names (e.g. garnier.com v garnierusa.com). Some sites will use a mix of these structures. For example, ASOS and Airbnb both use a mix of TLD and sub-domain structure. There are potential drawbacks to each, which we’ll look at in more detail. A sub-domain structure for international sites makes sense from an organisational perspective, as you can give autonomy to national departments easily, or have a more central governance. However, the sub-domain then has to take different languages into account and this can cause problems. As we’ve explored previously, there’s a risk of sub-domain cannibalisation with this approach. This is because Google will generally only feature one sub-domain from the same site in the SERPs per term, even if they offer different content. So, in the example above we can see the ASOS US sub-domain (yellow line) battling with the main domain for the term ‘coats for women’. This sub-domain page is optimised for a US audience with prices in dollars, and is the one ASOS would want to present to searchers. However, the conflict between domains means a proportion of traffic goes to the ‘wrong’ page. The same problem applies to Tommy Hilfiger’s site. Here, in results for Google UK, the UK domain has been superseded by its US counterpart for months at a time. Nike opts for the approach of a single site with different sub-directories for locations and languages. This structure should work well for a centralised company like Nike which can offer similar content across its locations. However, this also presents the problem of internal cannibalisation as different landing pages can compete against each other. 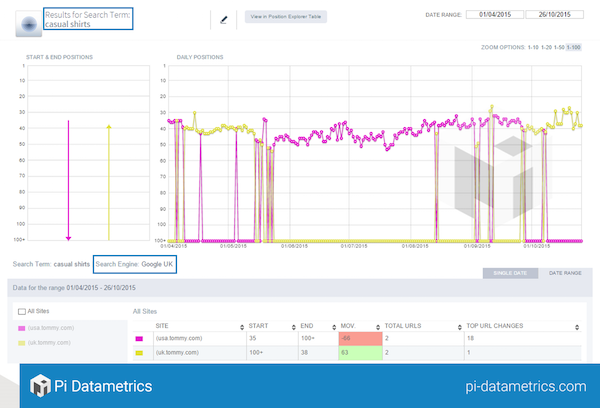 The chart below shows the problems Nike had in getting the correct page to rank in the UK SERPs. In the five month period shown here, the nike.com/gb domain (yellow line) has only ranked for a fraction of the time in the UK, meaning that visitors are being sent to the ‘wrong’ page more often than not. The same is true of Ted Baker here. 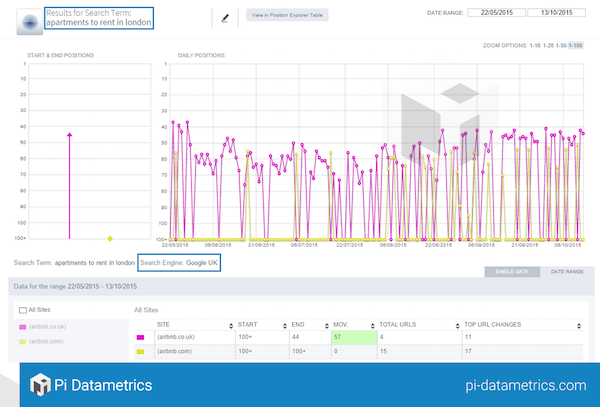 The pink line is the page that should rank on Google US but the UK site is more prominent. If you have a relatively decentralised business, then separate domains can be a good option. There are drawbacks though. For one, acquiring the same name across different territories isn’t necessarily easy to do. For example, if a company was set up in Europe then its likely to have a .com address. This means the name needs to be changed for the US market e.g. loreal.com / lorealusa.com. Semantic flux occurs when two or more interrelated domains coexist in the SERPs for the same search term, and Google fails to differentiate between them due to duplicate theming. Google sees similar content and pits them each other; treating them as the same domain and giving positions to just one at a time. This is what is happening with Airbnb. It has a .com and a .co.uk site but the content is virtually identical. This means, as in the example below, the US and UK pages compete with each other. Like Airbnb, Sta Travel has different domains for each country, but the content is similar. This causes problems when Google is deciding on the right page to rank. Here, it gets it right more often that not for Google US. The yellow line is the .com page, which Sta Travel will want to rank here. However, the UK page still causes some conflict. So what is the best solution? Is there one? This is far from straightforward as the examples have shown. There are potential drawbacks with each approach. “I’d suggest for any company that the best set-up is the folders, directory set-up. I like the folder because for SEO reasons it should be more simple to manage. However, as with Nike, there are all sorts of issues that can occur with that in terms of cannibalisation and users from different markets ending up on the wrong language page. There are pros and cons with each approach and much has to do with the way in which the strategy is implemented. 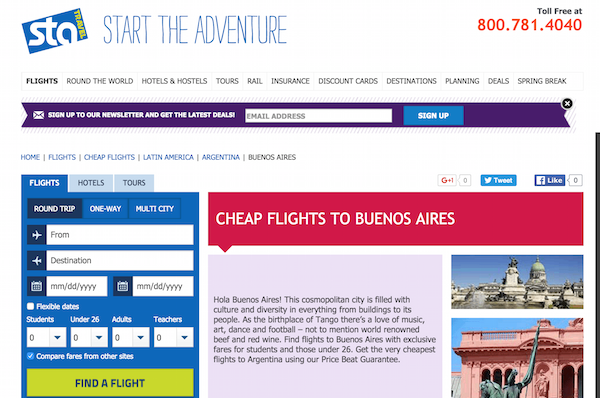 For example, Sta Travel may be right to use the separate domains strategy but by using virtually the same content on the pages it undermines its own search visibility. We could also look at Google here: is it doing enough to surface the correct pages? Should it always index the airbnb.co.uk pages on any Google UK search for example? After all, that’s the page that is most relevant for UK users.